There are a number of easy to use cell phones that have senior-friendly features such as bigger screens and keypads, amplified speakers, simplified cameras, and hearing-aid compatibility. Obviously there are many seniors who don’t need these specially designed phones and are very happy with their smartphones, but there is large group of consumers, particularly the elderly, who are looking for a simple cell phone that can be used to make and receive calls. To help you find the best cell phone for yourself, a friend or a relative we have put together a buying guide explaining what you need to know about selecting the right model, getting a good plan and finding the best provider for aging adults. When you are shopping for a simple cell phone, the features you are going to want to look out for are much different than if you are searching for the latest smartphone technology. If you are a person who wants a simple phone you will want to think about the initial cost of the phone; the monthly plan cost whether you want a camera, size of the screen, etc. If you are shopping for someone who is elderly and may have hearing or vision impairments you will want to think about the size of the screen, size of the font on the screen, the loudness of the ringer, how big the buttons are, are they easy to press. Here are some of the essential features to think about when shopping for this type of phone. Emergency Button – What makes most of these types of phones unique is that they have a help button that connects directly to a medic alert type system. You pay extra for the service, but it is beneficial for peace of mind for relatives and friends who are concerned about safety. Screen Size – If a senior has difficultly reading smaller fonts or seeing numbers on a small screen, then screen size may be a consideration. The loudness of ringer -Another feature that is typical for phones for the elderly has is the option to increase the ringer to a level that those who may be hard of hearing can hear. Hearing aid compatible – To figure out if a cell phone is hearing aid compatible look for the ratings (M) for a microphone of M3 or M4. The higher the (M) number the clearer the phone will sound. There should also be a telecoil rating of T3 or T4, and again the higher the T rating the clearer the conversations will be. Volume control- Most phones have an adjustable volume control. Battery Life- If you will be using the phone as an emergency phone that the user may forget to charge, getting a phone with a good standby battery life would be very useful. Some of these phones also have an option to text caregivers or family members when the battery is getting low, so they can remind the user to recharge. Ease of Use– This is incredibly important when shopping for a frail elderly user. You will want to ensure that the buttons are easy to see and to press down. It should also be comfortable to hold, and the display should be easy to read. If possible have the user try the phone out before buying. Reception-If you are in a rural area or an area that traditionally has a weak signal, spend some time looking at the coverage maps of any cell phone providers you are considering. There is no point in getting a cell phone if you can’t get proper coverage. Portability- Some of the new regular cell phones have the huge 4.7” and 5.5” screens, and although they make images and font size much easier to read, users may find that they don’t fit comfortably in pockets or purses, so before buying a phone with a larger screen consider how it will be used. Cameras- Most basic models now contain a camera. Style- There are a few basic styles when it comes to choosing a cell phone. 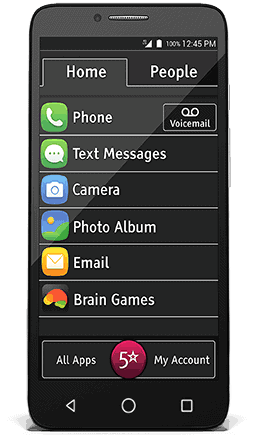 Snapfon is a standard phone with the keyboard and the screen on one interface. 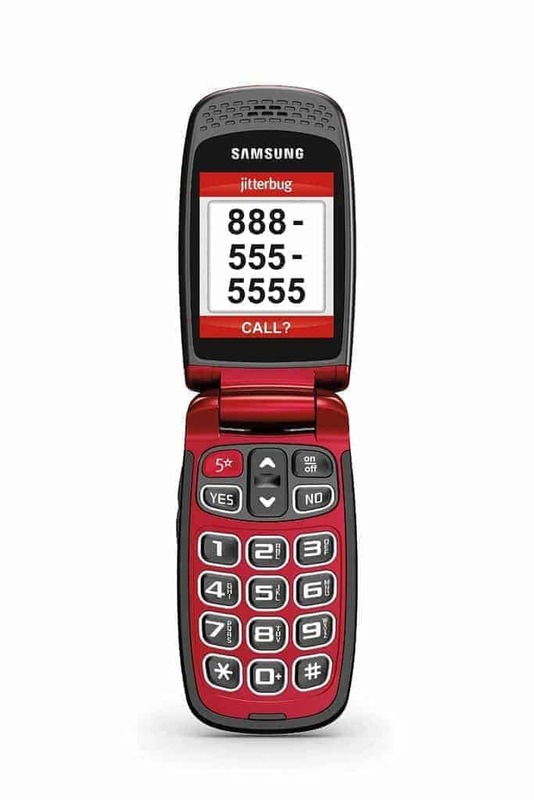 Jitterbug Flip is a flip phone style also known as a clamshell style, which means that two sections are joined by a folding hinge. Jitterbug Smart is a touch style, so you are touching the screen rather than pushing buttons. There are some considerations when budgeting what a cell phone is going to end up costing you. First, there is the upfront cost of buying the phone; then you will need to select the best plan for your needs. Some of the phones also have activation fees, as well as termination fees. If you choose a smartphone, you will need to consider how much data you are going to be using every month. The type of service plan you choose depends on how you are going to be using the phone. If you are only using the phone on a limited basis, you will probably want to consider a pay as you go service plan. It just means that you pay a certain amount of money into your account and as you use the phone, the credit goes down, when the credit gets low, you can top it up either automatically or by phone using prepaid cards that you buy at retail outlets. These types of plans don’t require a contract. If you will be using the phone often, send texts or use large amounts of data you will probably want to get a monthly service plan where you are charged a fixed amount every month. Monthly plans require you to commit to a fixed term that you will stay with that carrier- usually 1, 2 or 3 years. PROS: This cell has big keys, a well-lit display, a large emergency button on the back, it is easy to use, it has a flashlight, and a speaking keypad. CONS: Not the best phone for texting. There are also some consumer complaints about the poor quality of the feel of the phone. Bottom Line: If you are looking for an inexpensive, easy to use phone for someone who would benefit from having access to an emergency button and who also needs a phone with unique features like big buttons, large font, a keypad that will speak the numbers as you dial this is a great option. What reviewers love: This phone hits all of the key features that this niche market is looking for in a cell. It has big buttons, an easy to see display a help button (you can activate with any of their plans for $15) and a speaking keypad. This is also the number one selling cell phone that is specially designed for seniors. The screen size is 2 inches which will appear small to those who are used to smartphones, although it is full color and well lit. The talk time is a decent 3 to 5 hours with a standby battery life of 90 to 120 hours. You can test out this phone with a 30 money back guarantee if you order it through the Snapfon website. They have a few different plans to sign up for, you can view those here as well as checking the coverage map. Some other notable features, are it can text a family member if the battery is low, in case they are the ones who are looking after the phone for an elderly user. It also has a flashlight that can be useful in all kinds of situations and is Hearing Aid Compatible with a M3/T3 rating. 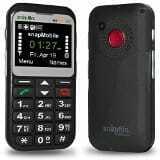 Who would benefit from this phone: This phone is excellent for people with low vision or who are hard of hearing, users who have weakened hand strength, family members who are looking for more peace of mind when caring for elderly parents. What could be improved: Of the big cell phone carriers this phone is NOT compatible with Verizon or Sprint. It will work with AT&T T-Mobile and U.S Cellular, so you may be able to add a line to an existing family plan. PROS: Easy to use smartphone with special features for the elderly like health and safety apps, and medication reminders. There is an option to add medical alert service to the phone plan. The menu has large easy to read text, simple interface. CONS: You can only use it with Great Call as your service provider; you can’t use this phone with any other carrier. There is also a $25 online activation fee or $35 live agent activation fee. It is a simple to use smartphone that is a Samsung Galaxy Ace Style phone that has been adapted by Great Call to use features that are helpful to some members of the senior citizen and elderly population. It has a simple easy to read menu organized into a list with links to phone, text messages, email, urgent care as well as a one-touch link to the 5-star app that will link the user to help in an emergency. It has an excellent battery life of 11.5 days of standby time, which is very useful for those users who don’t remember to charge the phone regularly. It also has other apps for Urgent Care with 24/7 access to nurses and doctors as well as an app called MedCoach to help users remember to take medication. Four inches and obviously since it is a smartphone it is touchscreen. Users generally remark on the excellent customer service of Great Call, and they like the option that the service offers specifically the 5Star medic alert button that provides peace of mind for users and family members of users. It is simple to use with a straightforward interface. You can get any of the android apps that you may want. The service coverage map is excellent as Great Call uses Verizon’s network. The big display and the fact that it allows you to link to family and friends make this a plus for me. There is also a medication alert to remind the folks to take their meds. There are different plans with different costs. The amount of talk time and text available varies with each plan you choose via GreatCall. The medical apps are already installed, and I just have to go through one company for plan service. The one button medical alert is easily accessible too. This is basically a super easy smartphone with basic functions. You can’t add the phone to an existing family plan with a major carrier; you must use GreatCall as your carrier. If you activate it only the activation fee is $25 for a single line and activation with a live agent is $35. Some users also feel that the data plans are too expensive for the amount of data you are getting. There are also reports that the battery life isn’t good and you have to recharge the battery daily. CONS: The plans are a little expensive for a flip phone. You can only use Great Call as a carrier, although they do offer many different service options. Bottom Line: If you are used to a flip phone and want something easy to use and doesn’t have all the bells and whistles but does offer an emergency button this is the phone to get. What reviewers love: It doesn’t get much more basic than this phone; it is the older style flip phone that is easy to close and carry around in a pocket. The interface is very simple with large easy to press buttons. The prominent selling feature is the five* button which connects to an agent that can offer assistance or dispatch emergency services. (if you opt into that plan). They can also call your designated emergency contacts in an urgent situation. If you are buying for a family member, you can download an app to your smartphone that can link to the Jitterbug 5 that allows you to see where the phone is and also the battery status. What could be improved: If you are planning on doing a lot of texting, this phone isn’t the greatest for that use. Some users report that this phone is difficult to set up. With the current aging population, there is a need for these types of cell phones. They help family members stay in touch, link users directly to emergency services and help provide peace of mind all for a reasonable price. Some people might object to the idea of a ‘senior’ cell phone. However, these types of phones are meant for the elderly; not the 60-year-old techies who are smartphone super-users. If you are looking for a device that can make and receive calls that are easy to use without extra features these senior cell phones are a great product. One note if you are looking for a phone as a user with physical limitations or disabilities, you may need to upgrade to a higher-end smartphone that has accessibility features. If you would like more information on how to find a cell phone for someone with disabilities, have a look at CTIA Access Wireless.